About 4 years ago I became online buddies with another nutrition coach, Diane Sanfilippo, who focuses on the Paleo eating and living. Do you know what Paleo is all about? For the most part, I am a Paleo fan. Real food? Avoiding sugar? Yeah baby. Although for me, restrictions against all grains, beans and pasteurized dairy products is a little too restrictive. So I’d like to say I “lean towards” Paleo. If you’ve been reading my blog for some time, you’ll know that I tend to avoid dairy and grains (especially gluten-containing grains) because they mess with my blood sugar too much. I find that protein and fats keep me full and happy much longer! But I’m flexible. And I encourage you to be flexible, too. There’s no 1 perfect diet for everyone. And we don’t have to prescribe to a single food theory for life. From what I see, super energized folks who like lifting heavy weights really benefit from lots of meat in their diet. That makes sense! And those who are more happy meditating and floating through yoga class tend to do well with less meat. But everyone feels better without processed food. Everyone. Quote me on that. Anyway. In the past 4 years I got married, moved to a new city and had a baby all while growing my business. It’s been hard, good work. Diane on the other hand – girl wrote a book! And it’s a New York Times Bestseller! Hot diggity damn! You may have even seen Practical Paleo on the shelves at the bookstore. I’ve been psyched to review what she’s put together and let me tell you – the title may sound like a “basics” book but Practical Paleo is super comprehensive, covering every topic from healing a leaky gut to cancer recovery to how to chop an onion. But mostly what I’ve loved is getting some new ideas for food that doesn’t require grains. As more and more folks move away from grains, we need to learn how to make new favorites. 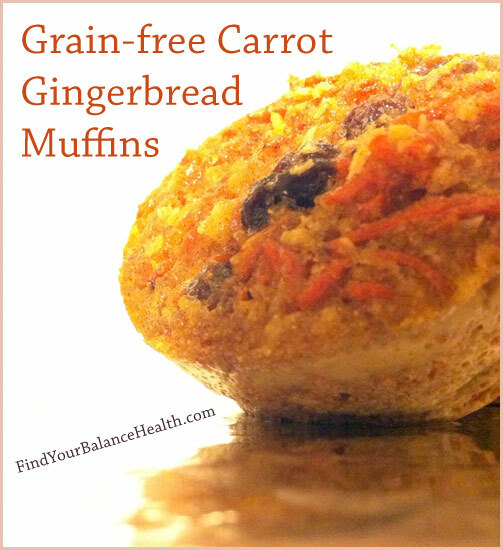 And Diane’s Carrot Gingerbread Muffins are definitely going to be one of my new favorites. This version includes a few tweaks I made: less sweetener (boy are these sweet!) and adding coconut. The original recipe has an optional frosting which I did not make. Shared with Dianne’s permission. Preheat oven to 350F. Whisk the eggs, butter or coconut oil, vanilla and maple syrup together in a large bowl. Sift in the coconut flour, salt, baking soda, cinnamon, ginger and cloves. Mix until well combined and fairly smooth. Add the carrots, raisins and coconut. Stir well. In a muffin tin, scoop 1/4 cup batter into each lined muffin container (I used a silicone baking tin which probably isn’t idea. If using liners in a metal tin, Diane recommends natural parchment muffin papers) and bake for 40 minutes. Cool before storing in the refrigerator. The best part about making these muffins was my little helper. My son is almost 2 and very good at pushing that food processor button with my hovering assistance. Get those kids in the kitchen, touching and smelling and tasting real food. That’s one dietary theory I do stick to, 100%. 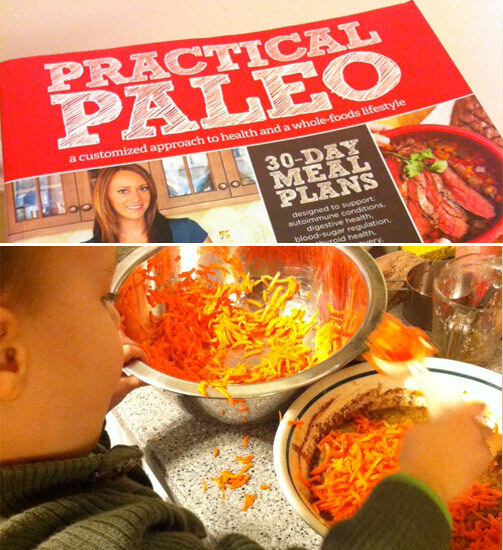 If you’ve been curious about Paleo or just dabbling in different food ideas, check out Practical Paleo for a really cool take on food and health – plus great recipes. I’m planning to try the Roasted Jalepeno & Garlic Sauerkraut next!